Today is my first-year anniversary subscribing to Tidal, which relaunched April 1, 2015, under new ownership of Jay Z. I love and loathe the music streaming service, which I cancelled at least five times and always renewed—typically before the billing cycle ticked over. But checking archived emails, I see that my sub completely expired thrice but not since July. Gotta ask: What fool starts a business on April Fools, and what does the day foreshadow; if anything? Apple did it, 40 years ago today. Many commentators have called Jay Z the fool for buying Tidal, which competes against established players like Spotify and newcomer Apple Music. The service claimed to have 540,000 subscribers when acquired last year. This week, Tidal revealed globally there are now 3 million subscribers. Someone correct my math—456 percent increase, right? If Jay Z’s the fool, gimme some of that foolishness. Still, Tidal trails rivals. As of February 2016, Apple Music topped 10 million subscribers; Spotify reached 30 million last month. Both figures come from publicly released data. In January 2015, Jay Z and his investment partners paid $56.2 million for Tidal, which history goes back to February 2010, when Aspire Group and Platekompaniet debuted the WiMP music service in Norway. The subscription streamer aggressively expanded to other European countries, and among portable and music devices, before adding lossless, CD-quality music under the WiMP HiFi brand on Oct. 1, 2013. A year later, the rebranded Tidal opened for business in the United Kingdom and the United States, focused on higher-fidelity encoding and streaming. By March 2015, before relaunch under new management, Tidal was also available in Austria, Belgium, Canada, Cyprus, Czech Republic, Denmark, Estonia, Finland, France, Greece, Hungary, Ireland, Italy, Latvia, Lithuania, Luxembourg, Malta, the Netherlands, Norway, Portugal, Romania, Singapore, Slovakia, Slovenia, Spain, South Africa, Sweden, Switzerland, and Turkey. Unlike some other streamers, Tidal does not offer a free option; elsewhere, freemium means advertisements. You pay to play—$9.99 per month for 320kbps compressed MP3s. Big spenders, those plunking down $19.99, get big sound. HiFi. Tidal’s appeal is twofold: HiFi encoding and artist exclusives, of which there are many. Competing stores or services claiming CD-quality usually deliver bitrate of 320kbps. They lie about what that is. The compressed files aren’t even close to the source material. Using the Free Lossless Audio Codec, Tidal promises the real thing: 44 kHz, 16 bit, and 1411kbps bitrate. I listen with higher fidelity headphones—Grado Labs RS1e and Master & Dynamic MW60, which I bought with birthday and Christmas money, respectively, in 2014 and last year. I hear the difference, and you may not, between the lossless and compressed AACs or MP3s tracks—even from Tidal. Detail is finer, overall ambiance is brighter (e.g. less muddy), vocals are crisper but also flatter, and bass is more natural rather than pounding. Because I can hear the difference, and really like it, Tidal pulls me back every time I try to cancel. I’m committed now; stopped trying to quit months ago. Exclusives are the other selling point. Among them, as I write: TWENTY88, a collaboration between Big Sean and Jhene Aiko; Edward Sharpe & The Magnetic Zeros’ single “Perfect Time”; and exclusive playlists compiled by artists, including Gwen Stefani and Jay Z. Kanye West’s album “The Life of Pablo” debuted on Tidal, exclusively during February, generating 250 million streams over 10 days. Exclusivity ended yesterday. The sound should be a big draw, but there is the price as barrier. According to Tidal, only 45 percent of the 3 million subscribers pay for pricier HiFi. Too bad, because lossless listening is the service’s distinctive feature, and it’s one sure to be obscured. I expect Apple Music to offer something similar sometime this year. My major problem with Tidal: Justify spending the $19.99 monthly fee; I have too many different monthly services, and some competing streamers offer family plans for $5.00 less than Tidal’s single-subscriber price. So, for example, six people can share the same Apple Music account for $14.99 monthly. Tidal does cut the price for additional users by half. Primary subscriber plus one other would be $29.98 per month, with both getting HiFi. The service does offer select discounts. Student: $4.99 for compressed and $9.99 for lossless. Military: $5.99 and $11.99. Available only to new, standard subscribers: First six months (after 30-day trial) discounted when paid as one sum. That averages out to either $8.49 or $16.99 monthly, depending on encoding. The web player requires Adobe Flash. The music catalog isn’t as extensive as Apple Music. The default playback setting on mobile apps is Normal not HiFi. Music playback doesn’t sync across devices; you can’t stop listening on one and resume on another. Tidal claims its music library tops 40 million tracks, while there also are 130,000 music videos. The user experience is excellent across interfaces. I have used the Android and iOS apps, as well as the website. 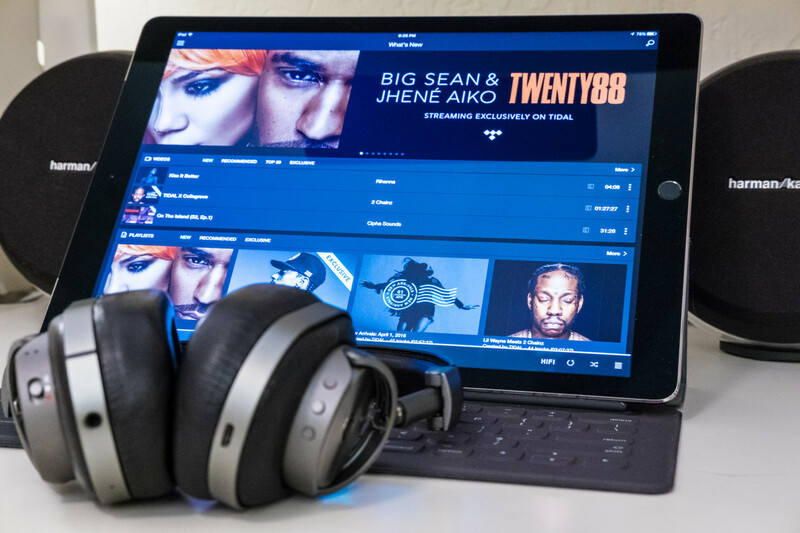 Features are comparable to Apple Music and other competitors, which makes Tidal’s apps immediately usable. Wrapping up, exclusives are fine, but any service can offer them. Audio encoding sets apart Tidal—for now—from major competitors. Wanna hear? I suggest testing Tidal by streaming The Beatles catalog from there and somewhere else. Vocals aren’t as crisp, bass is punchier, and high notes are more muted on Apple Music, for example. The questions: Can you hear the difference? If so, do you like it, and would you say twice as much for the pleasure?